Were Skipper and Brent on a rescue mission to find Taylor or not? Q: Were Skipper and Brent on a rescue mission to find Taylor or not? 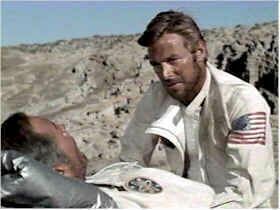 "In the acclaimed sequel to Planet of the Apes, another astronaut (James Franciscus) crashes through the time barrier searching for Taylor (Charlton Heston). The daring rescue mission leads to a subterranean city where mutant humans, who practice mind control, worship a weapon capable of destroying the entire planet." Brent: "Well, in my opinion, Skipper, we've passed through a Hasslein Curve, a 'bend in time'. Brent undergoes telepathic interrogation at the hands of the mutants. The following dialog further adds basis for my opinion that Brent and Skipper are a rescue mission, not just 'in the neighborhood and dropping by to see Taylor'... When the interrogation is going on, we (the audience) hear a chime which means that one of the mutants has sent Brent a question telepathically. He answers his inquisitors as fast as he gets a mental question which is why we do not hear the questions, only Brent's responses to these telepathic questions. "I'm an astronaut. I was sent here on a rescue mission to find a fellow astronaut: Taylor." "Well, from this planet, but from another time, 2000 years ago." "I came through a defect, a slippage in time. That's what must have happened to Taylor. I'm sure he tried to get back." "My skipper is dead ... I'm alone." Taylor: "Brent! What are you doing here?!" This proves that Skipper and Brent were following Taylor, following his last known trajectory, and even followed that trajectory through a deep space Hasslein Curve. When Brent says "Looking for you!" then it doesn't get much clearer that this is a ANSA sponsored rescue mission. The fact that Brent is familiar with the principles of the Hasslein Curve goes only further to show that ANSA, Hasslein, and the crews were aware of such phenomena and that they understood at least that this kind of phenomena might exist in their exploration of the universe. This is most definitely a rescue mission, it's not like Brent and Skipper didn't have anything better to do and were just 'dropping in' on Taylor and his mission to kill some time. But what kind of rescue mission is it? Did Brent and Skipper arrive in the same spacecraft? I doubt it and I have my reasons which I will point out as I go along. Check out the next question for an answer to that.